Journey through time to a gloriously extravagant Biblical setting of lust, violence, and betrayal in this meticulously restored Oscarr-winning* classic from legendary filmmaker Cecil B. DeMille. Victor Mature flexes his muscles through such scenes as Samson's barehanded battle with a lion, a single-handed assault on a thousand Philistine soldiers and the spectacular climax where he pulls down the pagan temple. All that action makes the picture exciting. But it's the seductive lady with the scissors, inimitably played by Hedy Lamarr that truly makes it great entertainment. With 1949’s Samson and Delilah, we get one of the final films from prolific Hollywood legend Cecil B. DeMille. After this, he’d make only two more flicks, but at least he went out on top: 1952’s Greatest Show on Earth nabbed a Best Picture Oscar, while 1956’s Ten Commandments became one of the most successful movies ever released. Given that I wasn’t wild about either of those films, I went into Samson with some trepidation, but I felt curious to check out this earlier flick. Set about 1000 years BC, the Philistines keep the Hebrew Danites enslaved. Despite this, Danite Samson (Victor Mature) falls in love with Philistine Semadar (Angela Lansbury). She appears somewhat indifferent toward him, but her younger sister Delilah (Hedy Lamarr) desires the Danite strongman/warrior. With Delilah in tow, Samson slays a lion and earns the right to marry a Philistine. Even though she’s already betrothed to Prince Ahtur (Henry Wilcoxon), the Saran of Gaza (George Sanders) allows Samson to choose Semadar – much to the dismay of a feisty, smitten Delilah. On their wedding night, Samson wagers with Ahtur and company on the answer to a riddle. Semadar betrays Samson to get the answer and she delivers the solution to Ahtur. This upsets Samson and he appears to renounce Semadar, who then immediately marries Ahtur. However, Samson still wanted to marry Semadar, so when he returns with payment for his debt, he feels none too pleased to find his would-be wife in the bridal chamber with Ahtur. In the ensuing fracas, Semadar ends up dead, and Samson spurns Delilah’s attempts to become his new partner. Samson goes on the lam and Delilah swears to get her revenge, two paths that the remainder of the film follows. DeMille directed the vast majority of his films in the silent era, and as I watched Samson, I wondered more and more if he ever really “moved on” from that period. To be sure, he managed to embrace the techniques that made his films appeal to audiences of the time, so I don’t mean to imply he became a dinosaur. 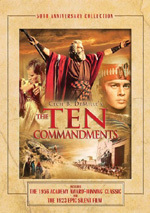 As I mentioned, Commandments was a massive hit, as were Greatest Show and Samson; apparently the latter was the biggest box office success in its year. I think about DeMille the silent filmmaker because his movies tend to feel like they would’ve required little adaptation to fit the pre-talkie era. DeMille favors big spectacle and over the top expression, with performances that often tend toward “scenery-chewing”, to put it bluntly. There’s a broadness on display as well as a certain simplicity, as it feels like DeMille likes to make events and characters as basic as possible. When he goes for spectacle, DeMille does pretty well. With the exception of the poorly executed lion-killing scene, the big set pieces of Samson impress. In particular, the climactic collapse of the temple offers a dynamic conclusion to the flick. Unfortunately, DeMille falters when he attempts character scenes, and since those abound in the slow, chatty Samson, the movie tends to drag. We get a fairly simple story here, but DeMille pads it to borderline “epic length”. Granted, 133 minutes – which is about 125 minutes if we exclude the opening/closing music – makes Samson about 90 minutes shorter than Commandments, but it remains a moderately long running time, especially given the lack of depth found in the story. While Commandments told a tale that demanded the “epic” treatment, Samson comes with a more basic narrative that gets stretched to fill time. 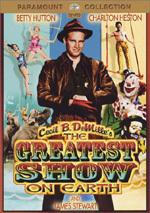 I suspect the movie could’ve covered all the appropriate bases in 90 minutes or so but DeMille the showman wanted to make it something bigger so he padded it. This means the movie really crawls at times. Virtually every scene goes on too long, so even potentially appealing sequences wear out their welcome. By the time the movie finishes, we find ourselves spent, as the whole thing loses punch as it progresses – well, except for the big ka-bang at the end. As our leads, Mature and Lamarr offer a study in contrasts. While Mature has the brawn for Samson, I think he looks “wrong” otherwise, mainly because he doesn’t convince as a Hebrew; Mature seems better suited to play a guy from Brooklyn than one from Israel. However, he manages a pretty restrained performance, which comes as a contrast against the wild-eyed Lamarr. She camps up a storm in a rabid, scenery-devouring turn. There’s no chemistry between the two actors, as they often seem to be in different movies. Even the usually reliable George Sanders can’t bring a pulse to the film, as the tedious feel of the flick brings him down with it. I do like our glimpse of a young Lansbury, though even here, she can’t catch a break, as Samson forces her yet again to play a character of a different age. In Manchurian Candidate, we see her as Laurence Harvey’s mother despite the fact he was only three years younger than she. It gets worse in Samson: she plays Lamarr’s older sister though Lamarr was born 12 years earlier than Lansbury! Even without age discrepancies like that, I find Samson and Delilah to offer a relative snoozer. It occasionally comes to life but it usually provides a slow, plodding Biblical epic that lacks the depth to keep us involved across its whole running time. Samson and Delilah appears in an aspect ratio of 1.33:1 on this single-sided, dual-layered DVD. Due to those dimensions, the image has NOT been enhanced for 16X9 televisions. This was an inconsistent but generally good presentation. Sharpness was the main concern here. Much of the movie provided good clarity and accuracy, but more than a little softness appeared as well. Though much of this related to the limitations of SD-DVD, I thought the picture came across as less precise than I’d expect. No issues with jaggies or shimmering occurred, and I saw no signs of edge haloes. Print flaws also failed to mar the image. Colors were pretty good. The movie went with a rich palette that usually displayed warm and full tones. Blacks were fairly deep and dark, while shadows came across with reasonable definition; some “day for night” shots seemed too dense, but otherwise the low-light elements offered positive delineation. In the end, only the softness distracted, as the rest of the image was pretty solid. Note that the DVD windowboxes the image. This means small bars at the top/bottom of the picture as well as thinner bars on the right/left sides. This seems unnecessary, especially nowadays, as overscan isn’t an issue like it used to be when tube TVs dominated. It’s not a significant distraction, but it’s a little annoying. As for the film’s monaural soundtrack, it seemed fine for its age. Speech comes across as a little thin, but the lines remained intelligible and concise enough. Music showed decent vivacity and range, while effects were clear and reasonably accurate; they could sound a bit rough in some louder sequences, but usually they worked well. Nothing here dazzled, but the track was perfectly acceptable. Unfortunately, the DVD comes with no extras – not even a trailer. While the story at its core boasts value, Samson and Delilah comes across as too long and too slow to exploit it. Despite occasional good scenes, the majority of the movie drags, and the lack of chemistry between its leads doesn’t help. The DVD gives us generally positive picture and audio but lacks any bonus materials. Fans who’ve long waited for a legit DVD release of the film will feel happy with this one, but I can’t recommend it to those new to the flick.